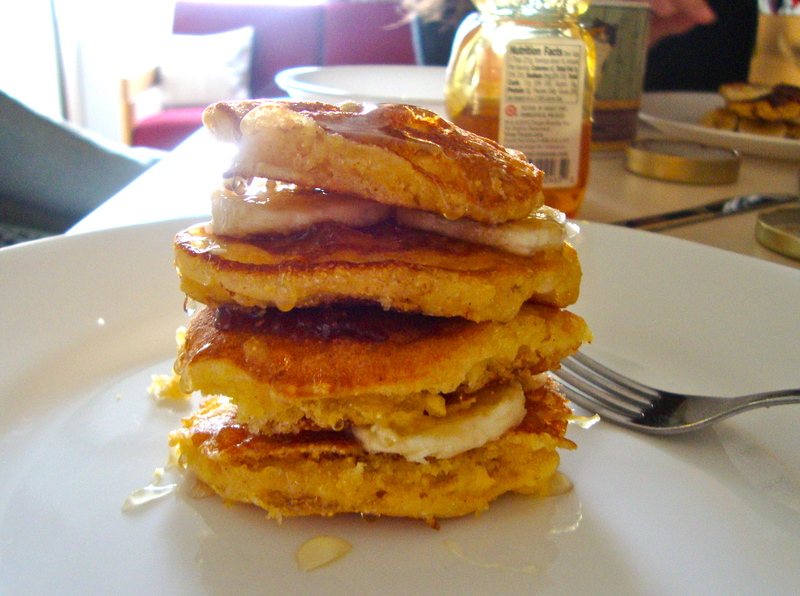 I’ve been dying to make cornmeal pancakes for weeks now, but the timing hasn’t worked out. Finally I got a friend to agree to come have breakfast and bring an egg (I happened to not have any). 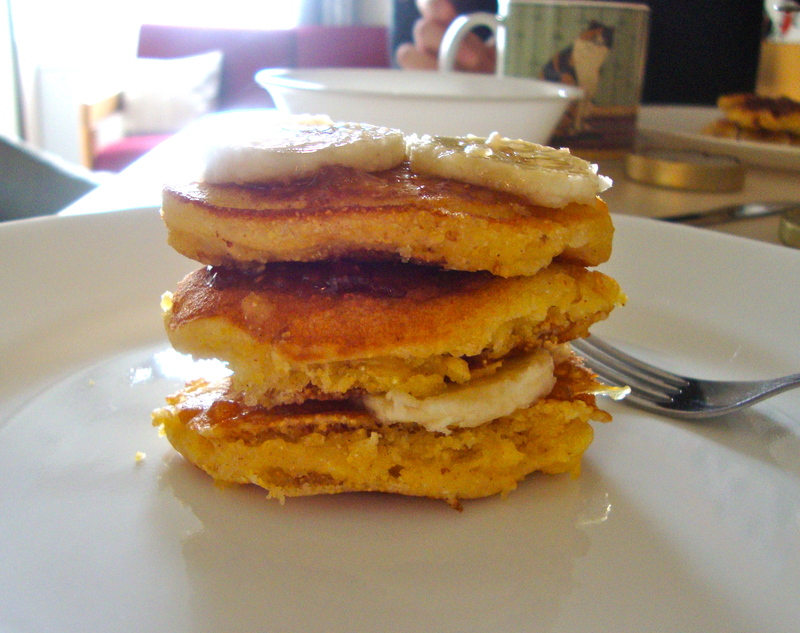 I think that this is the perfect Sunday morning breakfast. 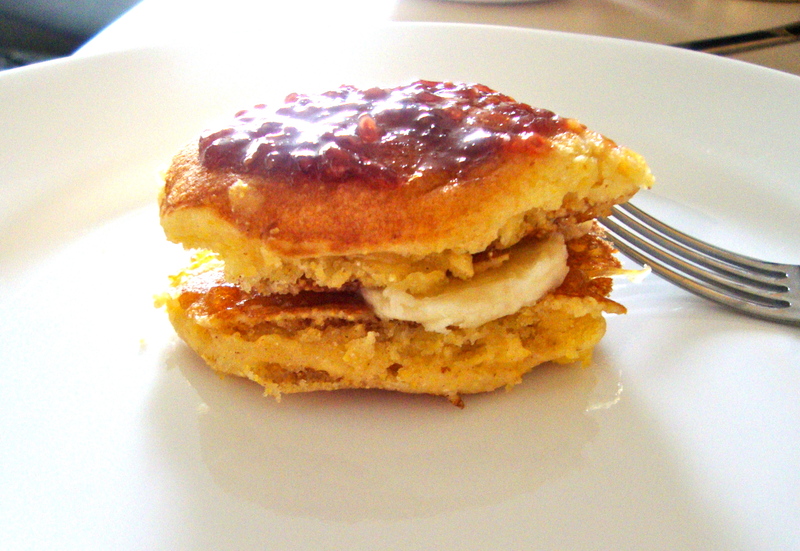 Not only is it beautiful to look at, you can choose your toppings and create your pancakes any way you like. I hope you’ll fall in love, too. The recipe on the box calls for 2 tbsp of melted shortening. I used canola oil instead, you could probably also use vegetable oil, butter or the recommended shortening instead. 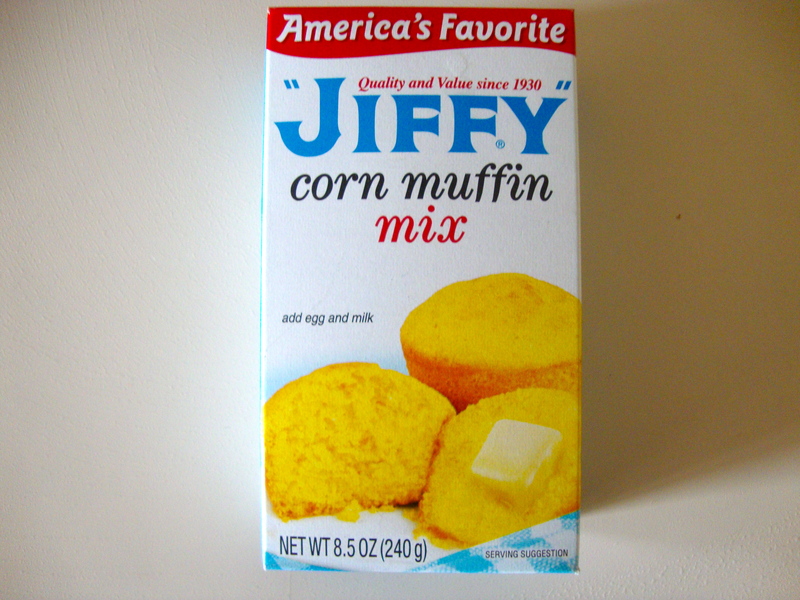 Take your Jiffy Corn Muffin Mix and put in a bowl. 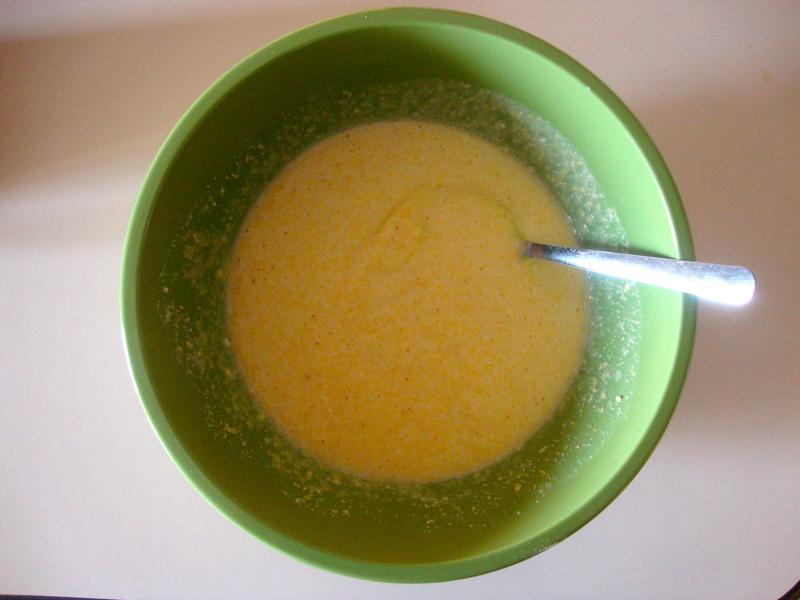 Add milk, egg, oil, and cinnamon, mix with a fork. 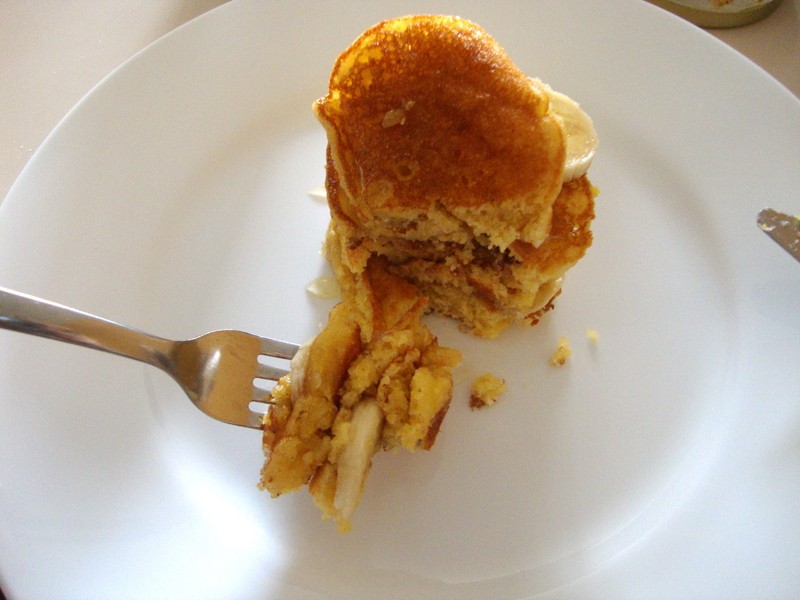 The batter should be lumpy. Let sit for about 10 minutes, this will help it to get fluffy. Meanwhile, heat your oven to 200 degrees. 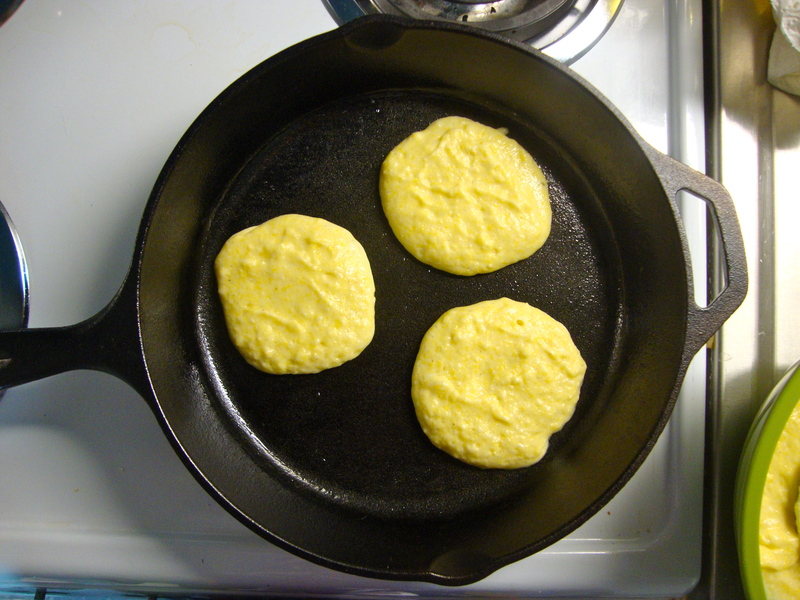 Place your fry pan on the stove and bring to medium heat. Once hot, coat the bottom of the pan with butter or canola oil. 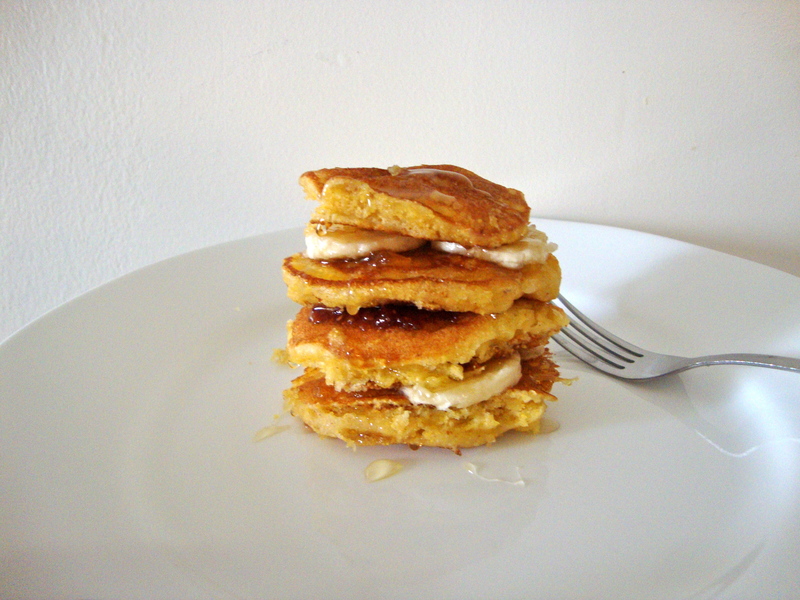 Be generous, you don’t want your pancakes to stick. Ladle batter onto fry pan. 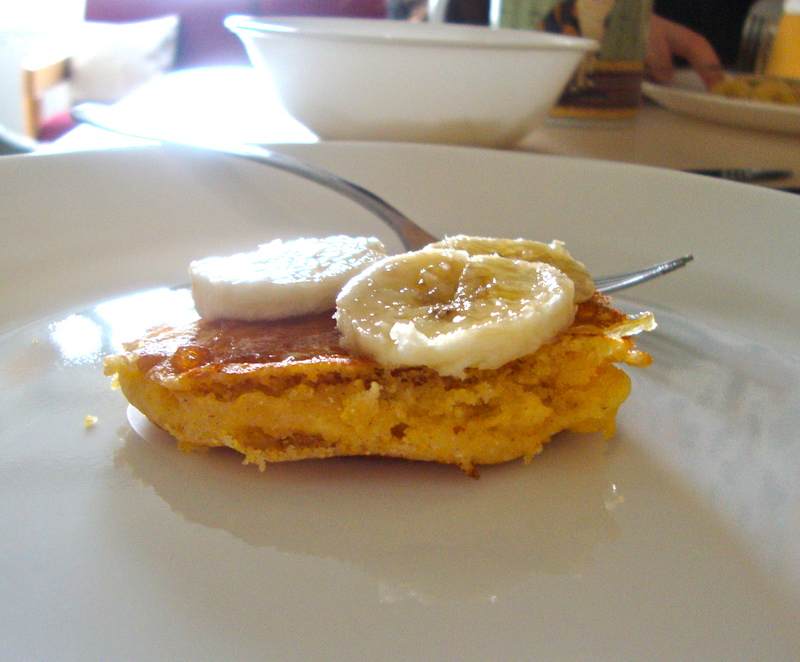 The pancakes will be very delicate so you want to make them small, probably only 3 or 4 inches in diameter. 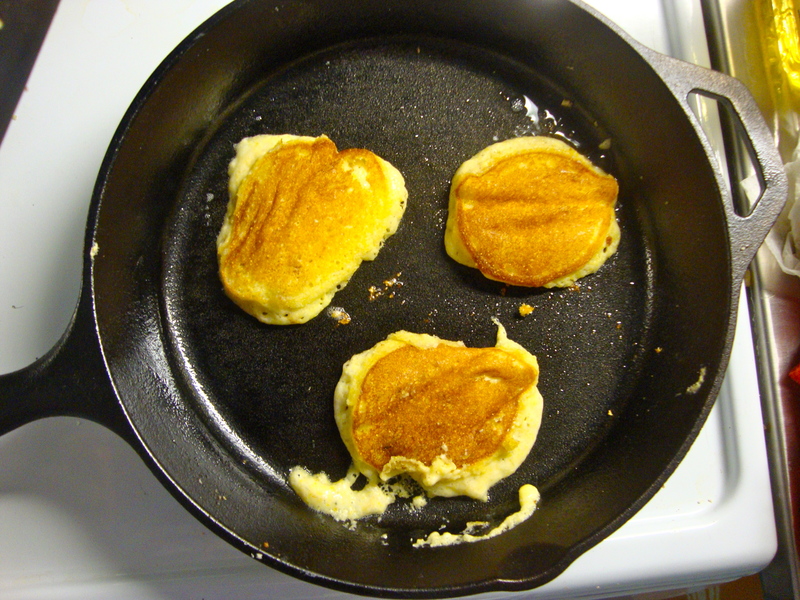 Once the pancakes start to bubble and the edges start cooking, gently flip them with a spatula. It’s likely that they will fall apart or get misshapen but just do they best you can (I’ll admit, I struggled to keep them in the perfect circular shape I wanted, but I got over it). Let cook until golden brown on both sides. Once cooked, add to a heat-proof dish and place in the oven to keep warm. 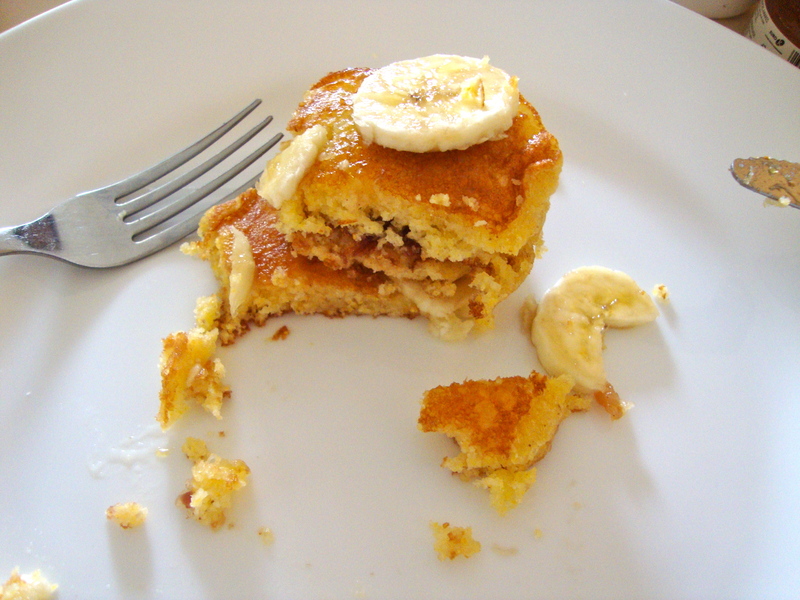 Keep cooking batches until you’ve used all the batter. You can serve these any way you like with any topping. 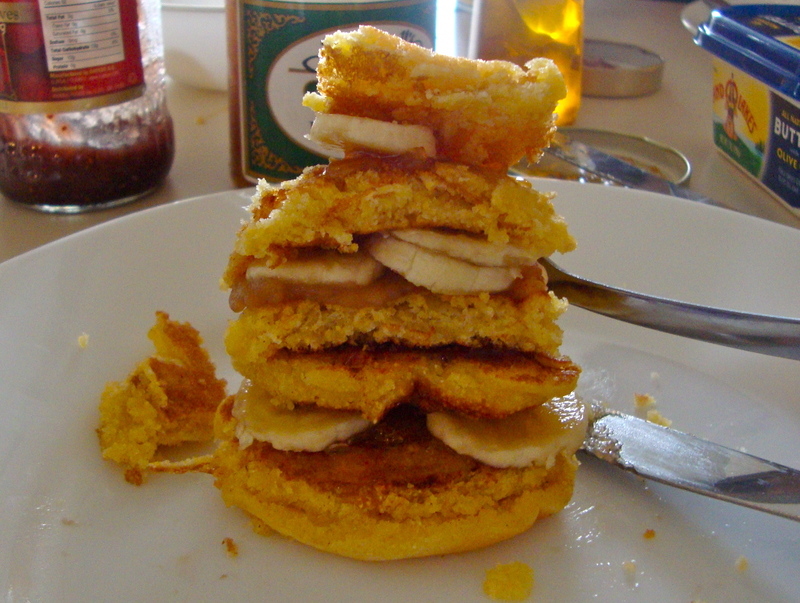 I made a tower with mine, alternating with jelly and banana between layers of pancakes. 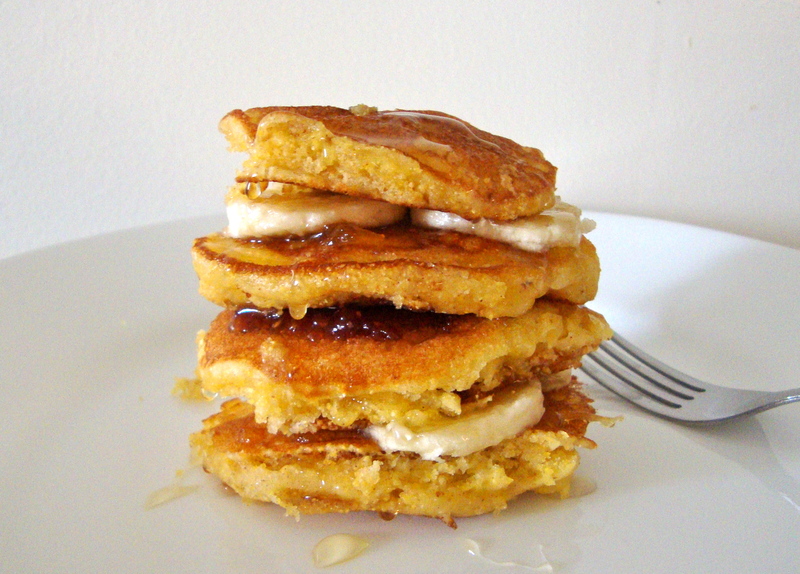 They’re excellent with a little honey drizzled on top. Enjoy!